Net Neutrality has become one of the most important and pressing issues facing the internet, pitting internet service providers against websites in a fight to determine how ISPs can treat web content. The laws surrounding Net Neutrality are constantly changing, and this article will be continually updated to reflect the current state of, and threats to, Net Neutrality. The Red Alert for Net Neutrality campaign began on May 9, 2018. While the FCC voted to overturn Net Neutrality in December 2017 (see below), the Senate is set to vote on a resolution to overrule the FCC and restore Net Neutrality using the Congressional Review Act (CRA). The effort to pass the CRA to overturn FCC's decision is being led by Senator Ed Markey, a Democrat from Massachusetts. Many websites are "going red" in support of the resolution, with efforts beginning May 9th and continuing on until the vote takes place. The movement is being coined as the "Red Alert for Net Neutrality" and is being spearheaded by Fight for the Future, a non-profit organization whose mission is to "ensure that the web continues to hold freedom of expression and creativity at its core", along with Demand Progress and Free Press Action. Notable companies that plan to participate in the Red Alert for Net Neutrality include Etsy, Reddit, Tumblr, okcupid, Mozilla, Vimeo, and SalesForce, just to name a few. You can learn more about the Red Alert for Net Neutrality at BattleForTheNet.com/redalert. Update: On May 16, 2018, the Senate passed a measure to repeal changes to net neutrality rules adopted by the FCC. The measure was supported by all 49 Democrats along with Republicans Susan Collins, Lisa Murkowski, and John Kennedy. The bill which will go on to the House is unlikely to pass; nor would it be likely to be signed by President Trump. Without any action from the House or President, the new net neutrality rules will take effect on June 11, 2018. However, this state of affairs didn't last long. On December 14, 2017, the FCC voted 3-2 to repeal net neutrality. The idea of net neutrality was first popularized by Columbia law professor Tim Wu in his 2003 paper, Network Neutrality, Broadband Discrimination. In it, Wu discusses all aspects of neutrality, i.e. between applications (“apps”), between data and quality of service (QoS)-sensitive traffic, and the dangers of two-tiered Internet access. Canada (who recently enacted new anti-spam laws), the European Union (EU) and other jurisdictions have also been grappling with net neutrality issues in recent years, and for the most part, have policies in line with the latest FCC ruling. In 2009, the Canadian Radio-television and Telecommunications Commission (CRTC) adopted strong net neutrality rules aimed at preventing bandwidth throttling (deliberate slowing of services by ISPs), the establishment of fast and slow lanes, as well as website blocking. From an e-commerce perspective, proponents of net neutrality claim that it will give small entrepreneurs a better chance to breathe online, let alone succeed when facing large conglomerates and their well-heeled lawyers and lobbyists. Small and medium-sized businesses are the backbone of America's digital economy, so it makes no sense to devote massive resources (bandwidth, hardware infrastructure, etc.) on a so-called “fast lane” internet that only the rich can access on a regular basis. It will harm technological and marketing innovation, and leave too much power and influence in the hands of a select few. The Obama administration and numerous grassroots organizations spearheaded the drive for net neutrality and classification of the Internet as a public utility. Upwards of four million Americans filed official grievances at the FCC to oppose efforts by large cable providers like Verizon and Comcast aimed at approving preferential or “fast lane” Internet access. Vinton Cerf, co-inventor of the Internet Protocol (IP). Tim Berners-Lee, creator of the World Wide Web (WWW). 'Last Week Tonight' host John Oliver. Senator Bernie Sanders (I - Vermont). Americans in favor of net neutrality who thought that the issue had been settled were in for a rude awakening. 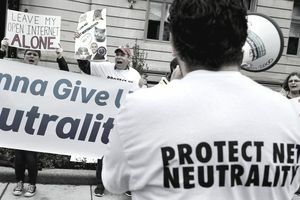 Although the landmark Federal Communications Commission (FCC) decision on February 26, 2015, presumably secured the Internet's treatment as a public good (Title II Order), political developments wound up reversing the letter and spirit of net neutrality rules that had been in place for barely two years. These were the most pivotal developments"
1. The 2016 Election of Donald J. Trump as President of the United States. President Trump's unprecedented path to the Oval Office was driven by a bewildering mix of economic populism, nativism, and a palpable dislike for America's political, media and entertainment establishment. That being said, Trump's personal views on net neutrality are difficult to decipher, since he is on record as criticizing Big Cable's (e.g. Verizon, Comcast, AT&T) monopolistic practices. However, he is likely to fall back on free enterprise and deregulation rhetoric, and defer to prominent voices who have opposed net neutrality for years. Those voices include Peter Thiel, arguably President Trump's most prominent high-tech backer during the presidential campaign. More importantly, the Trump victory ensured a Republican, anti-net neutrality majority on the FCC Board of Directors, headed by newly appointed FCC chairman (and rabid net neutrality critic) Ajit Pai (see below). 2. Appointment of Ajit Pai as New FCC Chairman. Chairman Pai's anti-net neutrality agenda has been clear since his appointment to the FCC commission by President Obama in 2012. In 2015, the former Verizon attorney was arguably its most visible and articulate critic, one of two commissioners to vote against net neutrality. As FCC chairman, Mr. Pai was put in the position to strip away these vital internet oversight rules. On May 18, 2017, the new FCC board's 2-1 vote was a first official step to reverse net neutrality in the United States. And the subsequent vote in December 2017 officially reversed net neutrality. While activists will press their case in the courts and the halls of Congress, for now, net neutrality is dead. Companies like Kickstarter, Reddit, and Amazon deemed July 12, 2017, as a “Net Neutrality” Day of Action in defense of internet freedom. They used a number of creative measures to educate and inform the public on the negative impact reversing FCC Title II protection would have on all Americans regardless of occupation, political affiliation, income level, etc. Net neutrality as an economic issue. Small business owners, startups and entrepreneurs need an open internet to grow, market and prosper. Net neutrality as a liberty and freedom issue. The importance of maintaining Title II enforcement on the Internet to prevent telecommunications giants from blocking, throttling or otherwise interfering with web traffic. Net neutrality as a racial and social justice issue. Maintaining a level playing field for visible minorities, the LGBT community and other historically disadvantaged groups to create, organize and develop without being subjected to “electronic” discrimination from powerful gatekeepers. Lest you think that the net neutrality debate has been settled, take note that there are many articulate and powerful voices who strongly oppose the recent FCC ruling. There is another side to this debate, and in another article we explore the arguments against a more regulated Internet, and how more creativity and innovation will be released online without the heavy hand of government regulation of the internet. While the FCC voted to overturn Net Neutrality, the Senate is set to vote on a resolution to overrule the FCC and restore Net Neutrality using the Congressional Review Act (CRA). The effort to pass the CRA to overturn FCC's decision is being led by Senator Ed Markey, a Democrat from Massachusetts. Many websites are preparing to "go red" in support of the resolution and to raise awareness of the issue and the vote starting on May 9th, 2018 and continuing on until the vote takes place. The movement is being coined as the "Red Alert for Net Neutrality" and is being spearheaded by Fight for the Future, a non-profit organization whose mission is to "ensure that the web continues to hold freedom of expression and creativity at its core", along with Demand Progress and Free Press Action. Notable companies that plan to participate in the Red Alert for Net Neutrality include Etsy, Reddit, Tumblr, okcupid, Mozilla, Vimeo, and SalesForce; just to name a few.